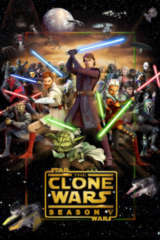 Bad news hit the internet for Star Wars: The Clone Wars fans, as Netflix's listing for the series on mobile shows an end in sight. Currently, the listing for the show says it's "Available Until 03/07/2017," meaning the full six seasons of the celebrated animated series would come off the streaming service that day. Fans can stream every episode of the show commercial free, including the sixth season that was first released on Netflix. It's not time to panic just yet, though. Netflix often puts the end of a contract date up as the "Available Until" date, even while a new contract is set to start that same day. Also, the film that kicked off Star Wars: The Clone Wars has no end date listed on mobile or main site, and it would seem odd for that movie, technically the first three episodes of the series before George Lucas decided to break it off, to stick around while the series went away. Finally, as noted above, the sixth season of the series, while now available on blu-ray, debuted on Netflix. It was a near unprecedented thing at the time, for a series to see work that was originally completed for another network show up on a streaming service that way. That means Disney/Lucasfilm and Netflix have a great relationship (and that's excepting the fact that Disney also has a broader distribution deal with Netflix, and that Marvel works with Netflix on regular original content. Phew). The status is officially that the series comes down in March, though, despite caution in believing what that states currently. Comicbook.com has reached out to Lucasfilm for comment and will update if and when we receive any on-the-record statement. Now, if only we could get Star Wars Rebels on Netflix in the meantime. Billy Dee Williams Gave Advice to Young Lando, Donald Glover!